If you want to find a local locksmith that you can trust and are located near to you in the North Shore area, call us now . Established in 1997, we opened our first shop in 2000 at Remuera, Auckland. Since 2003, we relocated to our present shop at 65 Paul Matthews Road, North Shore, Auckland. We are both mobile and workshop based, and offer commercial, residential and automotive locksmith services. You can browse through our huge range of security products in our shop. Our retail services are available to public and trade. We specialise in key cutting for houses, automotive, boats and machinery, as well as restricted key cutting. Recently we extend our service to laser engraving for pet tags and keys. We also change battery for watches, remotes and duplicate garage and car remotes. Edwin, the locksmith and owner, acquired his locksmith qualifications in 1993. 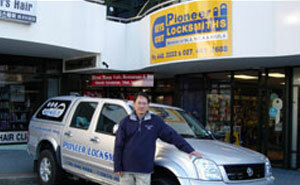 He is qualified as "Master Locksmith" of the Master Locksmiths Association Australasia. Edwin has been highly praised by many customers on his skill, workmanship and work ethic. "Extremely easy to work and trust worthy". 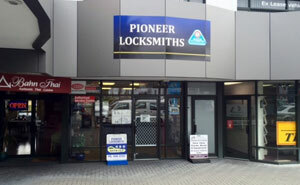 Pioneer Locksmiths services cover Albany, Beach Haven, Birkdale, Birkenhead, Browns Bay, Campbells Bay, Castor Bay, Coatesville, Dairy Flat, Devonport, Forrest Hill, Glenfield, Glenvar, Greenhithe, Herald Island, Hobsonville, Long Bay, Mairangi Bay, Marlborough, Meadowood, Milford, Murrays Bay, Northcross, Northcote, North Harbour, Okura, Orewa, Paremoremo, Pinehill, Redvale, Rosedale, Rothsay Bay, Silverdale, Sunnynook, Takapuna, Torbay, Unsworth Heights, Wairau Valley, West Harbour, Windsor Park, Whenupai and to the wider Auckland region.